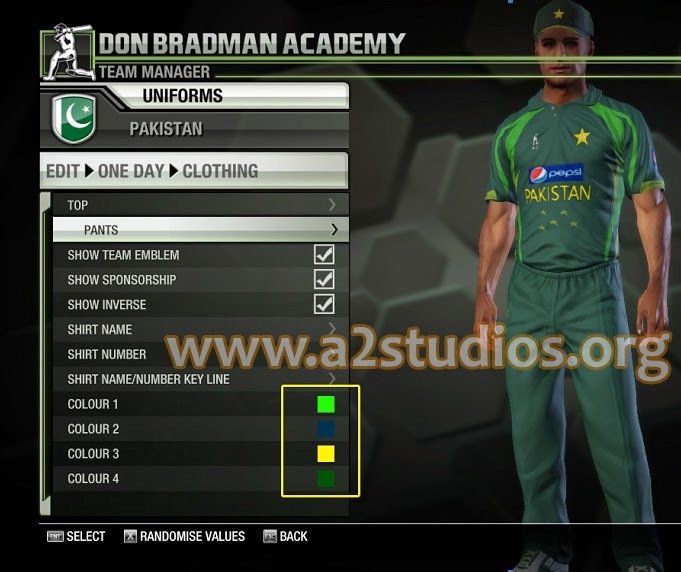 Pakistani Fans, here is Pakistani ODI Kit 2014 for Don Bradman Cricket 14. Download Pakistani ODI Kit for DBC14 now. The most awaited kit is released with download links along with installation procedure as follows. Let us know if you liked it? Kit has been accurately made by A2 Studios Shining star Shailesh Kumar (Follow him on Twitter @A2Shailesh). Copy "pattern_12_col" to "\Documents\My Games\Don Bradman Cricket 14\textures\characters\tops\Current_01” Paste it. Copy "pattern_02_col.dds" to "\Users\XXXX\Documents\My Games\Don Bradman Cricket 14\textures\characters\pants\Current_01". Set the Top Model to "Current01" and pattern to 13. Set the Pants Model to "Current 01" and pattern to 03.